Reviewing the second book in a series is never an easy thing to do, but for those of you who have not yet read A Discovery of Witches, let me bring you up to speed. Diana Bishop lives in world that appears to be like our own, but hiding just beneath the surface are the lives of “creatures”: supernatural beings that look like humans, but who are in reality vampires, witches or daemons (unstable creatures that dwell on the cusp of genius and madness). Descended from a line of New England witches, Diana nonetheless finds herself hopeless at witchcraft as a child, and so decides to turn her back on this world and become a historian, shunning the use of magic to get herself an advantage over her human colleagues. All is going well until a research trip to Oxford’s Bodleian Library leads her to discover two strange things: a lost manuscript bound in ancient and powerful magic, and the attentions of the respected scientist Professor Matthew Clairmont, an unusual thing indeed given the traditional distance kept between witches and vampires. These events quickly bring Diana to the attention of local creatures – who arrive at the library in unprecedented numbers, apparently expecting Diana’s discovery to lead to something – and to the Congregation, a shadowy parliament that rules over creatures, and tries to prevent them coming to the widespread attention of humans. Forming a forbidden bond with Matthew, Diana goes on the run to discover the secrets of the manuscript everyone wants but only she has seen: Ashmole 782. Shadow of Night picks up the story straight away by taking us back to 1590, where Diana and Matthew’s search continues, courtesy of some hastily learned time-spinning magic. Having lived through the Elizabethan era once before, Matthew assumes his identity from the period: we learn that he is none other than Matthew Roydon, spy of Queen Elizabeth I and the mysterious patron of the School of Night, a historically known group of scholars and writers that included Sir Walter Raleigh, the daemon Kit Marlowe and the poet George Chapman (whose 1594 work The Shadow of Night undoubtedly provides the source of inspiration for the novel’s title). As a historian and specialist in the study of alchemy, Diana can hardly wait to get stuck in to learning about her new surroundings, but soon finds that academic history and day-to-day functioning in the past are two very different things, something Harkness has great fun showing the reader. Together Diana and Matthew scour the late sixteenth century in search of the elusive manuscript that will one day become Ashmole 782, while trying to find a witch of sufficient powers to teach Diana to control her erratic magical abilities, without her being found out as a witch by humans who would happily burn her at the stake for her forbidden knowledge. Weighing in at a substantial 768 pages in my proof copy, this was a heavyweight read that impressed from beginning to end. In the previous book in the series, it was apparent in places that I was reading the debut novel of someone more used to writing non-fiction, but none of the hesitance or stilted phrasing was apparent in Shadow of Night: it read beautifully, and kept me absorbed throughout the week I spent reading it. Characterisation was good, and the way that real-life and fictional characters were woven seamlessly together and little pieces of the past explained in terms of Diana’s supernatural world were cleverly done (Queen Elizabeth was apparently well aware of creatures and sanctioned the witches of London to bring about the famous “English wind” that helped defeat the Spanish Armada in 1588). Of all the places visited, Elizabethan London was particularly well brought to life, but this is only to be expected from someone who has also recently published an academic tome on this very subject. As a lover of good historical fiction, Shadow of Night was right up my street: plenty of period detail, but introduced seamlessly throughout the text, not in the forced “I have learnt this in my research so I am going to use it whether it fits the plot or not” method that some other writers of this genre seem apt to use. Some readers may find the pacing too slow as the search for Ashmole 782 is abandoned for a few chapters while Diana finds her feet in the past, but I enjoyed this section every bit as much as the more adventurous elements of the story – really, for anyone unfamiliar with the ordinary life of Tudor England away from the court intrigues, this book will teach you loads. My only extra wish would be for a map or two to help set the scene, but this may well be present in the finalised version of the book when it goes on sale next month. Aside from this, the downside is the same as I found for the previous book, namely the length of time takes to produce novels of this length – I know I now have over a year to wait until I can finally find out how the All Souls Trilogy ends! With thanks to Headline Books for providing a review copy of Shadow of Night. 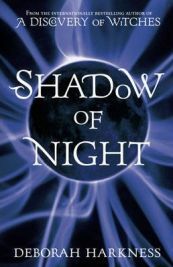 2 Comments on "Shadow of Night"
I really must read A Discovery of Witches…it’s been on my to-read list since I read your review of it, now there’s a sequel I should get a move on!